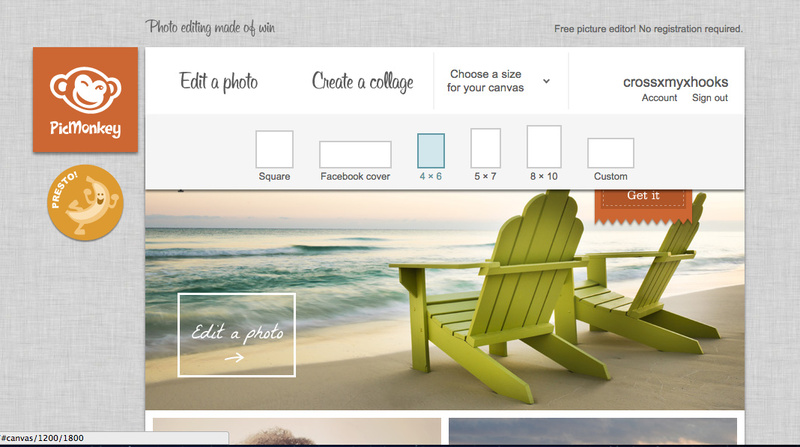 For this tutorial we're going to use my favorite online photo editor PicMonkey. If you don't have the Royale feature, don't sweat it - you can totally make an awesome card with out it. None of these steps involve Royale features! But if you want to try the awesome options that the Royale feature offers, click here to try the feature free for a day! 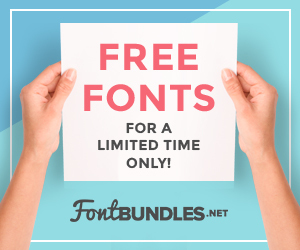 Head on over to PicMonkey & select a size to get started. We're going to crop down the image anyway so it doesn't matter which size, I went with 4x6. Now open this image in the canvas. 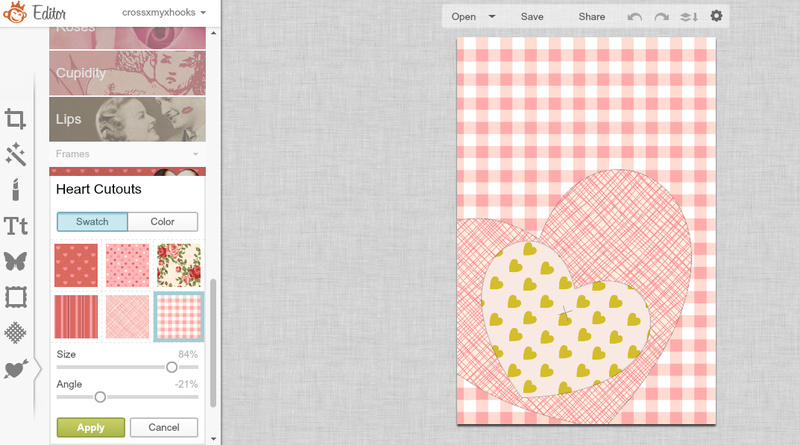 If you don't want to use my image provided you can search ColourLovers for patterns or even scan in a scrap book page. If you have any digital scrapbook pages, feel free to use those as well. Crop down your image so none of the weird border shows. This image is downloaded from my page on the ColorLovers website so it has the watermark there at the bottom. Crop your image in the ratio you want - I chose 4x6. I would suggest you use a standard cropping range & nothing too unique. You want this image to fit nicely on the page when you print it out later. Now on to the designing. At the bottom of the left hand options menu, click on the little heart with the arrow through it. It is here you will find themed options. 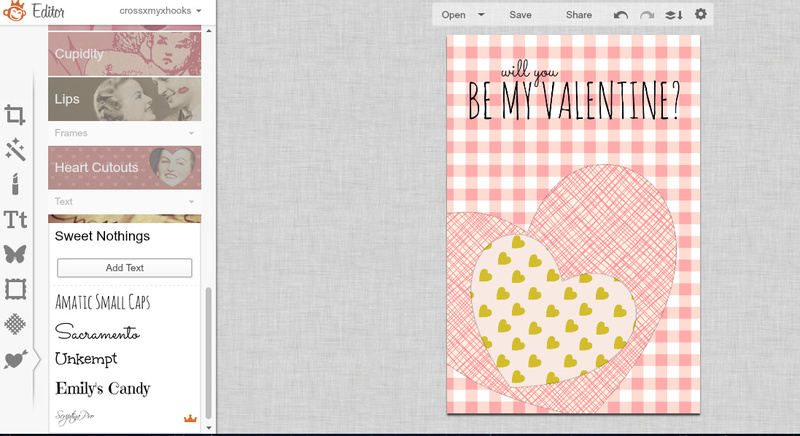 We're going to be using the Sweethearts theme for this card. Choose Heart Cutouts & begin to move & scale you're first heart. Choose a paper pattern you like as well. 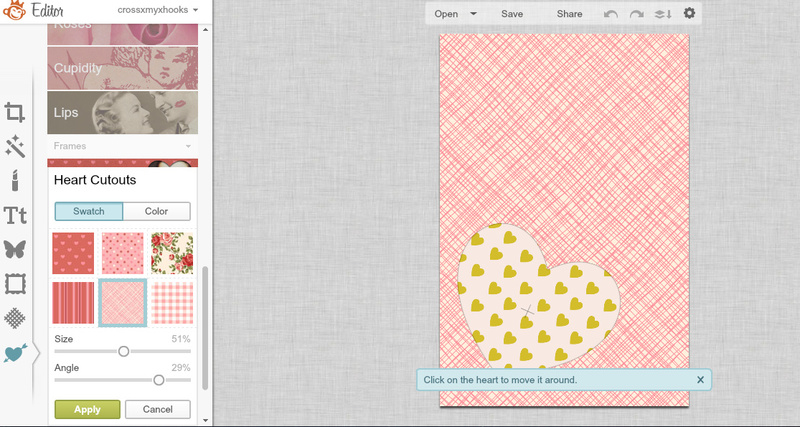 You can click & move the heart anywhere on your canvas & you can even have part of it hang off the canvas if you like. 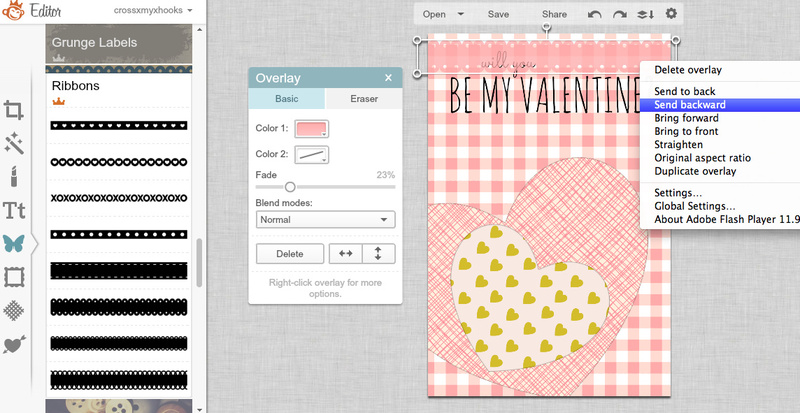 Add another Heart Cutout in a contrasting paper pattern. Move this around, scale it, position it how you want. I left room at the top for text. Using the Sweet Nothings fonts in Amatic Small Caps & Sacramento I asked you to be my valentine. 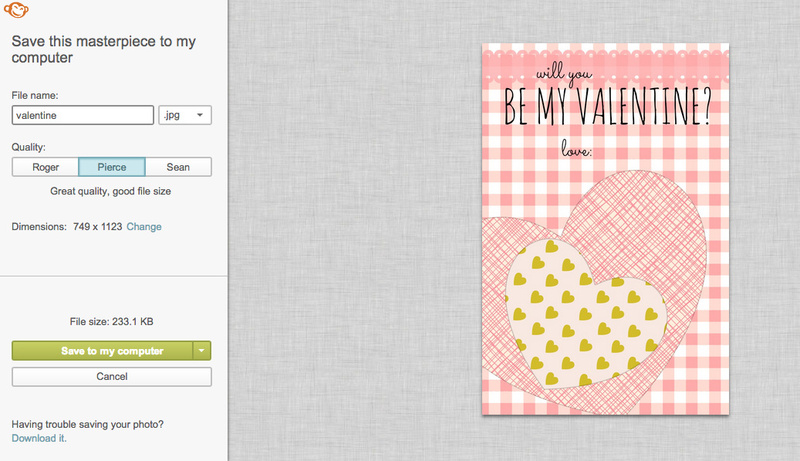 You can write whatever text you'd like to here & even personalize it if you'd like. Go sweet or racey with your sentiment - be daring if you want to! 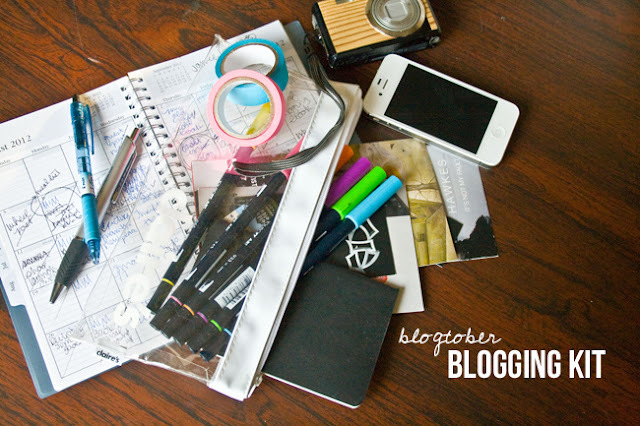 I wanted to show you a little trick here when using PicMonkey by adding a little bit of ribbon to the top. You can see that the pink ribbon is over the will you text, blocking it. Simply right click on the ribbon & select send backward to send the ribbon under the text. 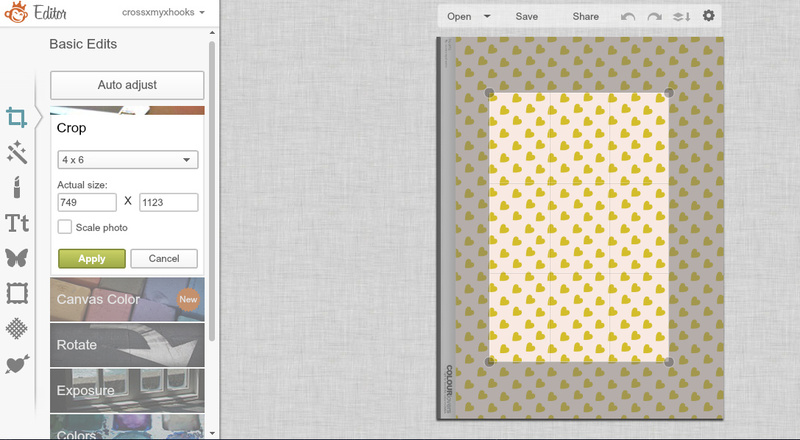 You can also choose send to back to put that layer on the bottom of all the other layers you've made. Now save your work to your computer. 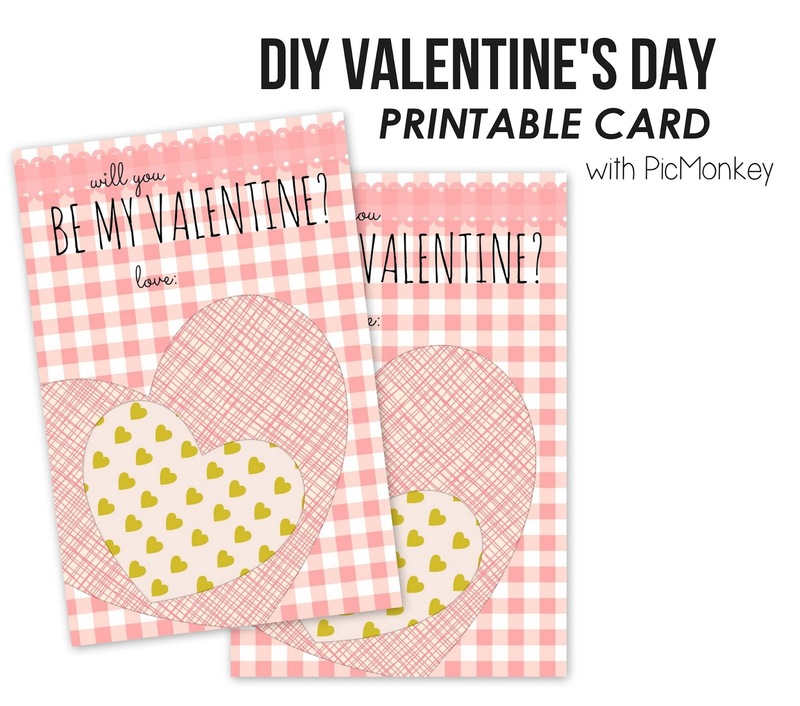 If you think you might want to edit your card later do not close the tab you have open with PicMonkey in it. This way you can edit your card if you find an error or find you might not like something after printing. 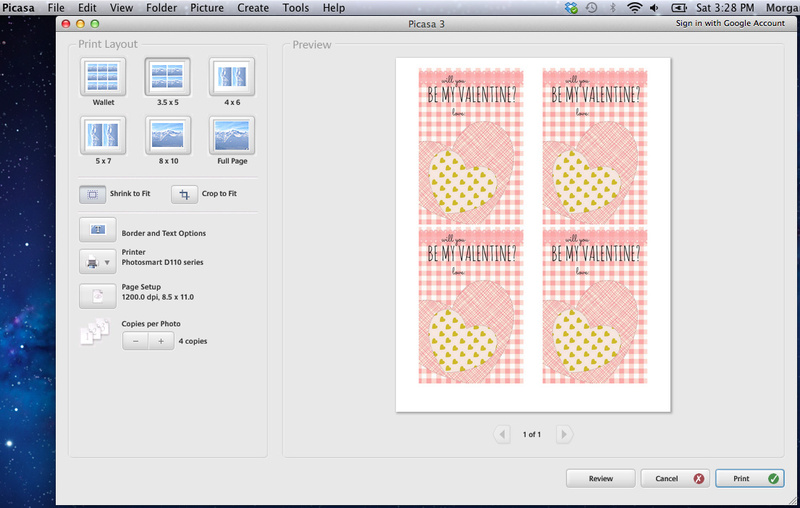 We're going to use Picasa to print our Valentine's Day cards. I've found this is the simplest, most user friendly photo program out there! 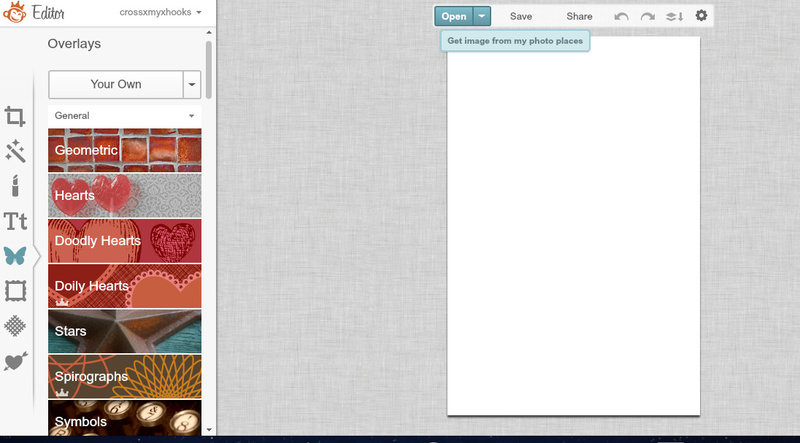 Open your card in Picasa & click File, Print. Under Print Layout select how many cards you'd like to see on your page. Select Shrink to Fit, then increase the number of copies to how many you'd like to print. 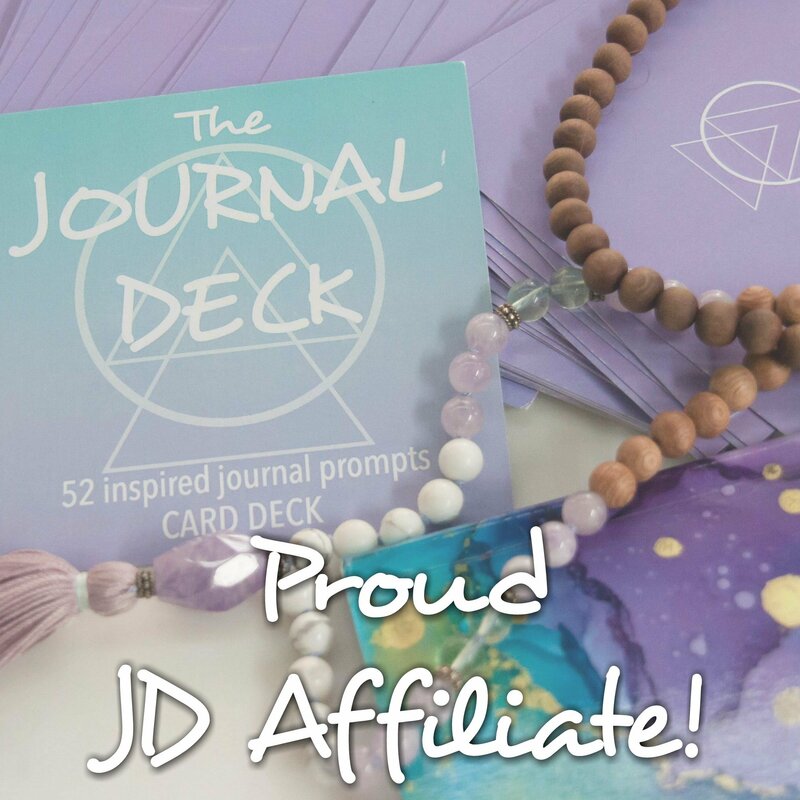 If you want to print more than one page increase copies until you have the page amount you'd like - but do it in multiples of the number of cards per page. In my example 3 pages will print 12 cards I need to increase copies from 4 to 12. Then hit print! Make sure you have colored ink & you're good to go. You can also have these printed from your original file at a place like Staples or Office Max. Just tell them you want it printed 4 to a page.